In any job, there are circumstances which motivate and those which demotivate. It is up to the leader to be aware of which is which. According to the Pareto principle (the 80/20 rule), it is essential for the leader to know what factors most contribute to results, to help guide his or her focus. This article discusses: (i) typical motivators and demotivators on construction sites; (ii) the Foreman Delay Survey, which is a good way to identify and eliminate obstruction factors and demotivators; (iii) Herzberg's principles concerning motivators and demotivators; and (iv) my experiences from managing construction projects and life in general. This article is a slightly modified chapter from my book, On Time and Under Budget: The Ultimate Power of Team Leadership, published in 2014. First, the foreman completes a daily survey of project delays for a week so as to identify what is causing the holdups. Second, the delays are evaluated, solutions brainstormed, and improved working methods are implemented. Finally, the results of the new ways are analyzed, and the cycle starts again, if necessary. One might think that a good supervisor does not need to do this, but I have applied these principles to projects thought to be going smoothly and has always found that the Foreman Delay Survey makes a difference. Even the front-line foremen are surprised when they quantify their delays. For example, on a recent project, I had a superintendent who, for some reason, did not want to hear about problems from the workers or the foremen. People were pulling me aside to tell me, the project manager, about problems they were having in the field. I noticed the superintendent's behavior whenever a problem was raised by someone under his command. He took it as a personal attack, instead of a call for help. This was an ideal situation for the Foreman Delay Survey. Figure 2 shows the results from the first week of that survey. 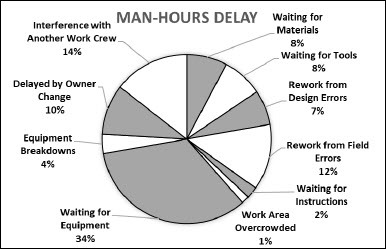 The total delay time was 9% of the total available working hours. Frustrating delays can have a compounding effect on labor motivation. This is because as workers become more frustrated, they lose focus on safety and their jobs, leading to more frustration and more delays. In addition, frustration is one of the four mental states that leads to accidents. Most delays are management controlled, so management should use this technique as a listening tool to uncover problems. Once the problems are identified, the root causes can be identified and eliminated. Having used this process on multiple projects, I have found that it takes about three weeks to achieve the organizational alignment necessary to eliminate most of the delays. 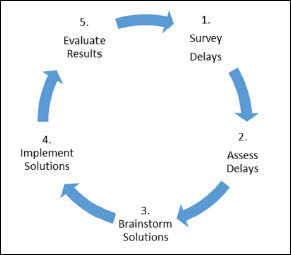 The process should be used frequently, if not continuously, as a project moves through various stages. Most delays are management controlled, so it is absolutely critical that management uses this technique as a listening tool to uncover the root of the problems. When combined with goal setting and the other principles, the Foreman Delay Survey is a simple and effective way to remove the problems, which lead to frustration and low morale, and consequently, a way of eliminating one of the root causes of accidents.